Summary: Karen Frank, a physical therapist and Gregg Frank, an occupational therapist discuss how catastrophic injuries that can occur from falls in the home and what can be done to make your home safe and more accessible to those with physical issues, including disabilities..
Summary: Greg Frank, OTR/L, CAPS, and Maria Renda, MEd OTR/L, CAPS, ECHM, discuss planning home modifications that enable access and movement through the living space and beyond. Summary: Licensed physical therapist Karen Frank and occupational therapist Gregg Frank, owners and founders of Back Home Safely, discuss their mission and the dangers facing older adults who want to live independently, and also offer advice on how to make your home safer as you near retirement. Summary: Greg and Karen Frank talk about how they found that their positions as outpatient therapists allowed them to provide help for outpatients… but not as much as they would have liked, which led to them founding Back Home Safely. Summary: Greg and Karen Frank are interviewed in an article dealing with the issues faced by aging individuals who have medical conditions that hinder their ability to live independently at home and how home modifications can help aging seniors age in place. 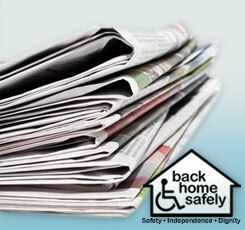 Summary: Gregg Frank, an occupational therapist, specializes in home safety and accessibility modifications. Summary: An occupational therapist is able to analyze all of the activities of daily living that an individual may encounter in their home, identify difficulties that their physical or cognitive impairments may cause, and offer solutions to these problems to create a safe and accessible environment. Summary: Karen and Gregg Frank assist caregivers by assessing and customizing their homes for safety and accessibility. Summary: Local “Life Transitions Group” gathered together Monday, November 14th to prepare Thanksgiving baskets for the homeless, struggling working families and the elderly.